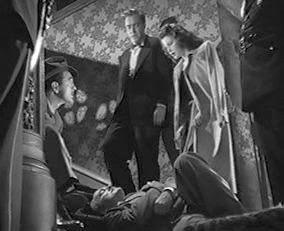 Robert Siodmak’s classic film noir, The Killers (1946), is notable today for its adroit combination of an intricate narrative with an expressionistic visual style. Born to a Polish J ewish family in Dresden, Siodmak started out in the German film industry and was imbued with German Expressionism. But with the rise of Nazism, he was forced to flee to France and eventually made his way to the United States in 1939, whereupon he made a number of important films noir during the 1940s. The Killers was said to be based on Ernest Hemingway’s suggestive 1927 short story, but in fact the film merely uses that story to set the initial stage for the ensuing narrative, which is entirely original. It is ultimately this intriguing original screen narrative, said to have been largely written by an uncredited John Huston, that has fascinated viewers ever since. It comprises a serpentine investigation into the events leading up to a murder that takes place at the outset of the film; and as the story unwinds and the truth is revealed, the fatalistic gloom that haunted the original homicide victim never lifts. Expressionistic films do not always give leeway for nuanced dramatic characterisations, but this film is graced by a number of memorable performances. At the top of the list is the alluring and seductive Ava Gardner, in her first major role. Sam Levene, as police lieutenant Sam Lubinsky, is extremely good, while Jack Lambert, as “Dum-Dum” Clark, and the soon-to-be-blacklisted Jeff Corey, as “Blinky” Franklin, are superb, as well. However Burt Lancaster, who was never a great actor but was often an engaging screen personality, is merely adequate here in his first screen appearance. 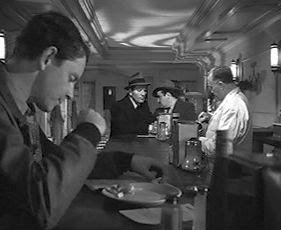 Interestingly, Siodmak would later use Lancaster in Criss Cross (1948) and again cast him as something of a sucker, not the ideal showcase for Lancaster’s magnetism. The narrative structure of the film has been carefully analysed by David Bordwell in his Narration in the Fiction Film (1985), which I recommend to readers. The film story starts out exactly like Hemmingway’s short story, with two hired killers terrorising the occupants of a small-town diner as they look for their intended victim, Ole Anderson, “the Swede”. One of the killers, by the way, is played by William Conrad, who was only 25 at the time of the filming but looks twenty years older. He would later look pretty much the same almost thirty years later when he starred in the television series, “Cannon”. Most of Hemmingway’s suggestive, laconic dialogue is preserved here word-for-word. But Hemmingway’s story, which did not describe any killing and gave no motivation for the killer’s intentions, is completely told after just twelve minutes of the film. The openness of Hemmingway’s moody story is what made it fascinating: we never know why the killers are hunting down Anderson, or why he is so resigned to his inevitable destruction. That original story's lack of resolution gave off an aura of fatalism and the hopelessness of overcoming brute, malevolent power. The film takes off from there and resolves some things, but remains fatalistic. Immediately after this opening cover of Hemmingway’s story, the killers in the film do find the Swede and bump him off straightaway. The rest of the story of The Killers reveals the intricate set of events that led up to this execution. Jim Reardon (played by Edmund O’Brien) is an insurance investigator given the routine assignment of examining the circumstances of the murder, and he quickly becomes obsessed in his efforts to find out what really happened. It is his quest for a fuller understanding that represents the narrative journey of the film. 1. 1946: Reardon learns from one of Swede’s coworkers at a small-town gas station that, very recently, Swede had been carefully eyed by a customer. Swede had quickly turned pale and gone home. 3. 1935: Reardon learns that Swede had been prizefighter and later had been arrested and imprisoned for two years, 1938-40, so he visits the cop who arrested him, Sam Lubinsky. Lubinsky’s visualized recollection tells of how he had been a boyhood friend of Swede and had seen his final fight in 1935. 4. 1938: Lubinsky’s wife, a former girlfriend of Swede, then recalls her final date with Swede in 1938, during which Swede became attracted to another woman, Kitty Collins (Ava Gardner). It was evident that Swede, no longer able to make money as a fighter, was now lured to criminal activities. Reardon then finds a former prison cell-mate, Charleston, who tells him two stories. 6. ~1939-40: Chareston's first story is simply his account of how he warned Swede that when a woman (in Swede’s case this would have been Kitty) stops writing to a guy in prison, it doesn’t always mean that she is ill.
7. 1940: Charleston recalls another time when they were both just out of prison, and he had escorted Swede to a meeting of crooks who were planning a big caper that could net $250,000. When Swede arrives at the meeting, he is shocked to see Kitty there with the others, which include Blinky Frankly, “Dum Dum” Clark, and the boss, “Big Jim” Colfax (whom we recognize, but probably unknown to Reardon, as the gas station customer from episode 1) who is now apparently Kitty’s new boyfriend. 8. 1940: Reardon then finds a newspaper story revealing that there was a $250,000 payroll heist about this time in 1940 at the Prentiss Hat Factory. As Reardon’s boss reads the newspaper account aloud, the heist is visually dramatised, with a spectacular crane shot showing the heist and getaway in a single, long take. Reardon’s, and the viewer’s, fabulas are now taking shape – he can link the robbery with what happened at the Atlantic City hotel. 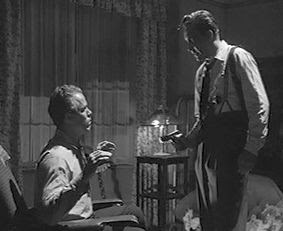 Lubinsky, in the present, now informs Reardon that Blinky Franklin has just been shot and taken to the hospital. The dying Franklin, who had recently read about Swede’s murder and his last whereabouts is almost delirious, but his rambling statements are dramatized in two successive episodes. 9. 1940: In the first visualization of Blinky's ravings, he recalls the nasty chemistry between Colfax and Swede just before the robbery back in 1940. 10. 1940: The second visualisation of Blinky’s ravings recalls how three of the robbers, but not Swede, had gathered together just after the robbery at a farmhouse, which was not at the “halfway” house as originally planned, because it had burned down the night before. They were interrupted by Swede, who broke into the meeting at gunpoint and complained of haveing been uninformed about the changed meeting venue. Swede then left with all of the loot. 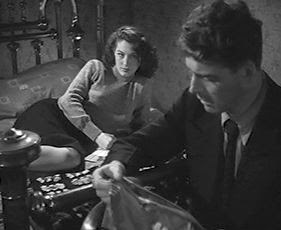 At this point Reardon, in the present, figures the money must be hidden back in Swe de’s hotel room where he was killed. 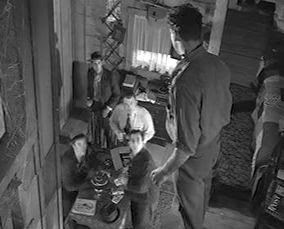 He goes there and runs into Dum Dum Clark, and they get into a scuffle, which results in an unwilling exchange of information. After Dum Dum gets away, Reardon heads out to Pittsburgh with Lubinsky to seek out Colfax, who reportedly now operates as a legitimate building contractor there. Reardon has also let it be known to the underworld that he now has the “goods” on Kitty, and by this ruse he manages to smoke her out of hiding and take her to a local nightclub to “talk”. 11. 1940: In the last visualized episode of the past, Kitty reveals how she suckered the Swede and made off with all the money. The whole thing was an elaborate double-doublecross – making Swede think that he had been doublecrossed at one level so that he could serve their purposes by counterstriking, but actually doublecrossing him at another level so they could collect all the money for themselves. It had all been planned from the beginning by herself and Colfax. 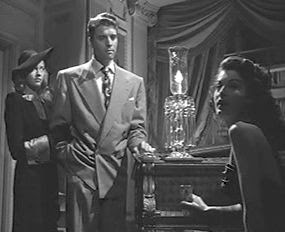 Then in a nightclub gunfight involving the same “killers" who had murdered Swede and who had now been sent to finish off Reardon, Lubinsky kills both of them, but Kitty manages to escape. Lubinsky and Rearden (his fabula construction now slightly ahead of ours) then rush off to Colfax’s mansion, but Dum Dum, seeking his share of the lost loot, got there first, and the two gangsters have both already fatally wounded each other. Each of the episodes provides Reardon (and us) with some additional information that will shed light on upcoming episodes and ultimately help him unravel the mystery. According to the plot as presented (the syuzhet), the episodes are numbered sequentially, as listed above. But according to the fabula, the episode sequence should be ordered as follows: 3-4-5-6-7-9-8-10-11-2-1. The fatalistic mood of The Killers is pervasive. None criminal characters ever really has a chance. Swede, Dum Dum, Blinky, and Colfax die in 1946 over events that took place in 1940. As far as the outer world is concerned, the fates of these people are pointless, anyway. Reardon’s boss points out how the insurance business works. As we know from the present economic and financial news, the business world is a vast mechanised structure that always ensu res the public will be fleeced for whatever costs are encountered. Reardon’s boss reminds him that whenever the insurance business loses money, they simply recoup their losses by increasing their rates to the public for the next year. There is no escape. The two original Hemmingway “killers” were wiped out, too. Kitty is also going to be sent away to prison. In fact, Ava Gardner’s role as Kitty, the ultimate, soulless femme fatale, is particularly emblematic of our vulnerability to malicious seduction. She completely dominates the muscular but helpless Swede, and even at the end of the film she is seen trying to coax one more favour out of Colfax -- only, Colfax is dead.